We can never explain God simply can we? Never, no matter how much we try. Oh we can pretend that we can. We can for instance call God, “love”. All that needs saying right? No, it but starts the conversation surely. How does this “love” allow for all this hate and misery and pain and suffering in this world of ours? And even before these creatures called humans deigned to stand up and gaze over the grasslands, it was so. Some animals are carnivorous, feeding off other passive creatures. How “loving” is that? When the opposable thumbed ones stood up, did they do so out of a desire to see the world in a bigger context or because it enabled them to see danger when it was still far enough away to do something about it? Before they too became somebody’s meal? Creator of the universe? Yes, but is this “our” universe, or a lot of “ours” universe? Is it our playground or simply our small slice of this one? Are there many? Do they each have a God, or is this one running them all? Is Jesus our Jesus, or is Jesus, Jesus everywhere? Oh you know the answer? Confess, it’s only a guess. You guess you know. You choose to believe you know. You don’t really know. Is that the essence of God? Is it determining to believe what you can’t know? But perhaps I cannot know what came before the “Big Bang”. Astrophysicists tell me that I may not ever be able to. Is that where God is? Are we all just struggling humans trying to make human sense out of what is not human? After all, did the psalmist have it right when he said, “how hard for me to grasp your thoughts”? Can I grasp them? What exactly is “in my image” mean after all? We are tantalized with both you see, the confounded frustration of never “getting it” to the assurance that we can. Or at least the belief that we can. For that image thing surely means that we must “think” in the manner of God, in the sense that 2 + 2 = 4, and if A = B, and A = C then B = C. It must be like that, surely? So why can’t we KNOW for God’s sake? Actually why can’t we know for our own sake, for surely God doesn’t need us to know, but we desperately need to know. Or don’t we? Is there some delicious wonderment in believing rather than knowing? Is that comforting and empowering somehow that cold factual knowing can’t be? After years on his cushion, a monk has what he believes is a breakthrough: a glimpse of nirvana, the Buddhamind, the big pay-off. Reporting the experience to his master, however, he is informed that what has happened is par for the course, nothing special, maybe even damaging to his pursuit. And then the master gives the student dismaying advice: If you meet the Buddha, he says, kill him. Why kill the Buddha? Because the Buddha you meet is not the true Buddha, but an expression of your longing. If this Buddha is not killed he will only stand in your way. If that’s true, and it may well be, then what are we to do then? Toss the bible in the trash? Stay away from every edifice that signifies the place of knowing, i.e., Church? Don’t read what anyone writes about the subject? Because the minute you think you have a handle on God, like partially set jello in your hands, it slides away? The minute somebody makes sense, or assures you that they know, you can be very sure they don’t? How much clearer could that be? And pray tell, why does Augustine then proceed to tell us so much about God? We are driven to explain what is inexplicable, and by its very nature is probably clearly not what we explain. Perhaps it is what keeps me in the Catholic church and out of it at the same time. I don’t trust the messenger any more, yet I know God is there. It’s all very funky in my head when I try to sort it all out. Perhaps sorting is the wrong thing to do. Just let it ferment old girl, just let it ferment. It will take care of itself. I do know that this passage has stayed in my head for more than a week. I can’t shake it. I guess I ask God a lot for wisdom. Maybe because that is one of the few things in the Bible where a feminine aspect of God is clear. Wisdom is SHE, damn it, and if you don’t like it, well too bad. that are intelligent, pure, and altogether subtle. because of her pureness she pervades and penetrates all things. and an image of his goodness. 28 for God loves nothing so much as the person who lives with wisdom. Until God so chooses to grace me, I remain but a God Seeker. But then, truly, whether we know it or not, aren’t we all? This is a troubling passage for most of us. 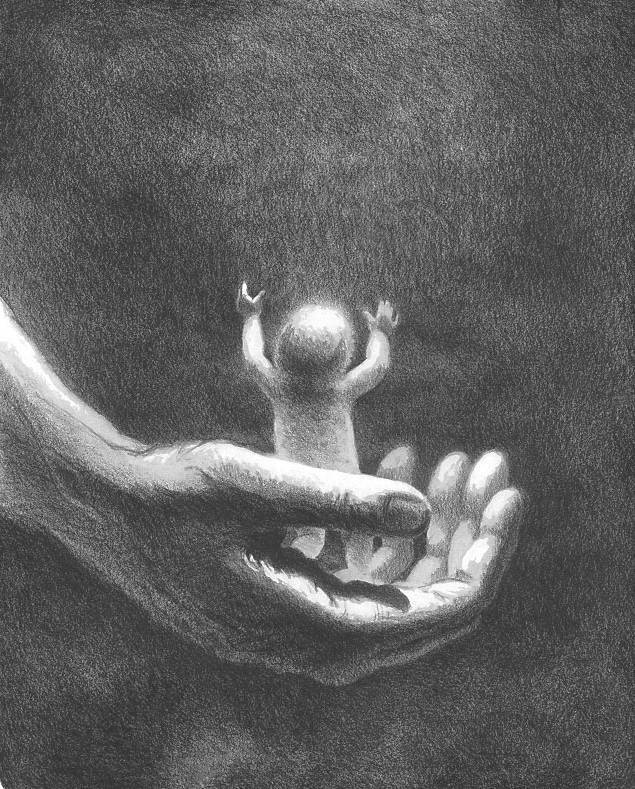 It suggests that no matter what we do, we are too small, too limited to understand God. When faced with some calamity or other that we cannot understand, we say oh so mysteriously “God has his reasons, and someday we will understand.” Such nonsense is less than helpful to the one suffering, but we are at a loss and so we say such inane things. For a variety of reasons, many biblical scholars conclude that the real first attempt to set down in writing the oral traditions of the early Israelites didn’t occur until the tribes had secured the land of Palestine. That is only a beginning of course, relating to the ancient times, the exodus, the wandering and the entering into the land. It is no little stretch to see why this might be so. Given the bloody history of the take over of the land by the various tribes, it is not unexpected that some effort would be made to tailor the stories to defend all that invasion and mayhem as God-ordained. Similarly when we look at the histories in Samuel, Kings, and so forth, we see justifications for the political lifestyle that was being faced by those returning from exile. We see theology melded around political necessity and reality. We see the winners proclaiming truth. The losers no doubt had their own version. So what do we make of this thing called “THE BIBLE”? A collection of writings, all unknown today, and perhaps largely unknown at the time. At least the source of much that was put down in written form had come from hundreds if not more than a thousand years before. Traditions oral, handed down from generation to generation. And more than one in some cases for the same basic “history”. We can of course make it all quite easy. We can simply declare that it is all written at the direction of the Almighty Himself–not exactly dictated, but placed within the mind of various scribes exactly as God desires, and they faithfully scribbled it down as if it was being read to them in their mind. To make it a “human” endeavor, we are told that each writer used his own “words” although it is hard to explain why God’s words wouldn’t be considered the best. We can do this, making the Bible the “word of God”, smiling smugly and going on with nary another thought, glad that that problem has been laid aside as solved. No matter that it is not remotely true of course, or that someone so grand and perfect could surely “write” a manual of behavior much simpler and easier to understand. 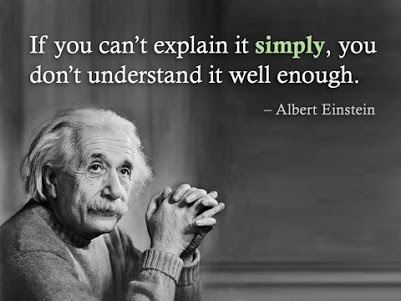 And do not say it is not hard to understand. If that were so, then pray tell why are there so many (30,000 at least) various “churches” all claiming that they have got it right and nobody else, quite right. To say nothing of all those millions who actually in their arrogance eschew “experts” and find the document easy enough for the average person to understand as written. We actually know that the bible, or should we say the various writings that would one day be declared, by men long dead, the bible, have been rewritten more than several times. They are not all the same, there are longer or shorter versions of some books, parts left out, and new parts added. We can tease apart a good deal of this, but it all leads to something called an “oral tradition” that is not capable of being “located” or known. Our oldest copies are not so very old when we look at what they refer to. Most are from the Common Era, after the birth of Christ. They are copies of things we no longer have, and they are probably copies of other things we don’t have either. And on it goes. And the most we can say, is that God, we trust, has held these minds in loving embrace while they struggled to explain their history and times and how God had occupied their world and influenced it, changed it, and directed them. If we are to believe that God really means free will, then he did not put words or thoughts in their minds, but loved them fiercely and from that relationship trusted that they would speak truthfully as they understood. So some of what they believed is true, and some is just not. But they were well-meaning, honest, and dedicated to showing this wonderful God as the center of the universe they lived in. And that is the best we can expect. And it is humbling, this knowing. For we are no different. We are well-meaning, and we are honest, and we too are dedicated to explaining to ourselves and to each other how this God we so love works in the world and in our lives. And we struggle with words, and ideas, and concepts. And we don’t get it all right, but we get some of it right. And a thousand years from now, others will continue doing the same. And bit by bit, perhaps we will piece together some mosaic of this Godness. At least enough to know that it is too grand for each of us, for all of us. It is a process we experience, this doing God. It is touching ourselves in our aloneness, and in our neediness. It is discovering that the only important thing is love, and from that all good comes. And when we feel that perfect loving peace for short moments, then we know in some place deep inside that we have for a brief instance brushed aside the veil and we have seen. And we scribble hurriedly before it slips from us, as it must. And others will judge if we have hit the mark or failed, far from now. John explains in the words of Jesus himself, that Jesus is the chosen shepherd and that his followers “know” him and intuitively “know” the thief and reject those that would lead the flock astray. And we, believers that we are, somehow understand this. Yet, we also recognize that this is not universally true. We may believe that as individuals, we each “know”, but of course we know that this cannot be actually true. Somebody has got to be wrong. Faced with atheists who taunt believers with “prove your God,” I of course know that resort to Holy Script is no answer. Yet, I cannot give the proof requested. For the only proof that non-believers accept is that akin to the scientific method, logical reasoning using deduction, induction and syllogistic rationals. And of course, much as Aquinas and others think they do this, they do not. Faith is faith after all. It is that which is believed though not seen. Stick in any of the general senses we use to navigate this material world, and the answer is the same. Believed but not heard, not felt, not smelled, not tasted. Most of us acknowledge that we don’t know know. We believe. Yet this belief is so strong that we are more than willing, even happy and joyous to spend significant time each day reaching out to touch the ineffable yet real presence of God. We sense in a way not explicable, yet real, that deep within us resides the real “I” that is forever and perfectly connected to its source. We therefore know that Jesus’ words to us are true, yet we know to that we are vulnerable to mistake. We can never let down our guard and relax in some security that our baptism is “enough” to protect us from the false teacher. 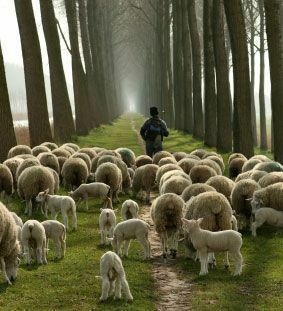 Only by constant vigilance, only by constant seeking in the depths of our being, are we assured that God’s true voice rings clearly enough to let us know we are striving aright–following the true shepherd. And this effort is not effort at all, it is not frenetic nor frightening, not anxiety provoking. It is our labor of love, it is our goal. We seek that precious knowing not to alleviate suffering or the pain of not knowing, but because that knowing is the truest most authentic living of all. It is what God desires for all his creation.